Over in NZ they treat overseas applicants as new recruits. They would require Grant to attend their training centre in Wellington for 5 months (residential) once we move over. However, the information we've had is that there is currently a waiting list for the courses and that the next four intakes are full so they are not putting a start date on the job offer. This means that when applying for Permanent Residency it may not be treated as a genuine job offer, causing difficulties in getting PR. It also means that even if we do get PR we will have no job to go to, until Grant's name comes up on the waiting list. "Guy and I do have our PR. We are well versed in the process having helped my parents, my brother, my sister and Guy's sister through it. "After submitting our EOI [Expression of Interest], it took 2 weeks to get picked from the pool. This seems to be a fairly consistant time frame. After that, it took 3 months to get our PR. It was not an easy process. There was a lot of back and forth, but we finally got it! Guy's sister also took about 3 months. My parents' PR took 6 months as did Kyle's [her brother, who is a cop in South Auckland]. My sister had some job issues, and she still doesn't have her PR after over a year! "In our experience, provided you meet the minimum points requirements, medical requirements and the primary applicant has a job offer, you will not have any problems obtaining PR. The police force is an approved overseas recruiter, which just means that if you have a job with them, your application has good bias with immigration and are bound to get a speeding pick from the pool and PR. "Guy's sister only had 130 points [we have 135], was picked from the pool in 2 weeks, and had her PR within 3 months. NZ suffers from serious brain-drain and are in desperate need of more cops, especially in South Auckland. You guys are a shoe in! "Hope Grant hears from the powers-that-be soon! I read your blog every day to see how things are going. We know how dreadful the UK is for children. I am positive everything will go smoothly (well, as smoothly as is possible) and that we will see you guys here soon. "I have just spoken to Kyle, and he feels that he can lend Grant a hand and offer some advice and encouragement. He says that Grant has his numbers. He is on leave at the moment, so has some time to spend with him if needs be. "I am going to ask Guy to send you a message regarding PR applications etc. When he was working in football/soccer, he did a lot of immigration for the players that they recruited from overseas and so has a lot of insight into the process. "had a bit of a better day today, v nice to talk to you earlier. i went to 2 local beaches today, only about half an hour each time cause it was v hot again, about 30 deg, slathered myself with sun cream, but missed a few spots which are a bit pink now. "there are loads of places that you can park around here and walk to a beach and you can choose if you want a quiet or busy beach. 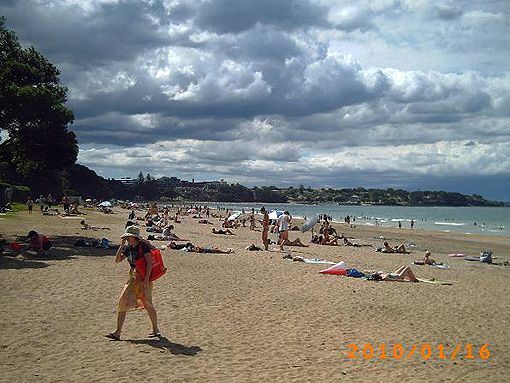 of course it was a busy saturday so the busy beach was quite busy, both beaches are within 10 min drive from the house. 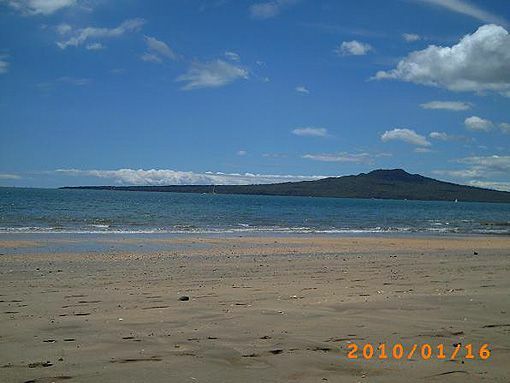 "1st beach i went to in morning was quiet and 2nd was busy as you can see in the photos. the sea water was chilly but pleasant, much warmer than the SA beaches. after 2nd beach went to pak n save and bought groceries for the week, and a few treats. everyone is in shorts, t-shirts and jandles (sloppies), it's great. "also spoke to kyle on the phone and feel a bit better about the whole police thing, i'm invited for supper at theirs on tuesday. "he says he failed the english part and had to redo it when he was going through the process, he doesn't think he had to wait 4 months, he seems to remember they let him do it sooner. he also says that they treat you as if you are a nuisance until you have passed everything and then they treat you better, they also never reply or contact you and he thinks it's part of the process to see how committed you are and if you are bothered chasing them. that's exactly how i felt, but he says i need to keep pestering through the whole process, like i did when i was chasing for my results, it shows you are keen. i suppose they have hundreds of applicants and many who just fall away cause they aren't that keen and can't be bothered chasing. "he says that when he went through training they had 80 people per wing (4 wings a year) but now they have 40 per wing, so you never know, if they have loads waiting again they might increase the wing size and the waiting list will drop. 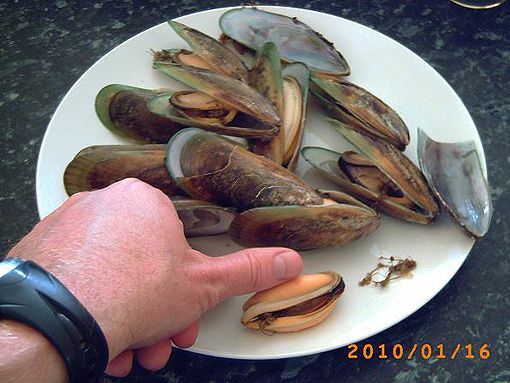 "got home and had mussels for a starter, i've been seeing these live mussels in all the supermarkets in the fish section, with water spraying on them to keep them alive, so finally bought a few to try, they weren't bad, not the best i've had. "also sometimes laugh to myself with some of the words they pronounce here. there's an advert on radio selling tinting for your car windows. says: the darkest legal tint you can buy....the way they pronounce tint is 'tent' and then when the coyles were packing for the camping trip they packed their tent...which they pronounce 'tint'. also they pronounce pear as if you are saying beer but with a 'p'." So we'll see. All we can do is continue taking it one step at a time and hang on tight on this emotional roller coaster.